Transportation Minister Todd Stone said Monday a potential 6.7 per cent hike to ICBC basic rates is too high but gave no indication of whether the government would reduce the dividend it takes from the public auto insurer. Aug. 31, 2015 7:00 a.m. The Insurance Corp. of B.C. is warning motorists they’ll soon pay more for basic auto insurance. Because of a rate smoothing policy introduced by the province in 2013, this year’s rate hike must be between 3.7 and 6.7 per cent – within 1.5 per cent of last year’s 5.2 per cent increase on basic rates. ICBC president and CEO Mark Blucher said the initial calculations suggest the maximum 6.7 per cent basic rate hike is required, but pledged to work with the government to find ways to reduce that number by Oct. 30, when the formal rate application is to be filed with the B.C. Utilities Commission. 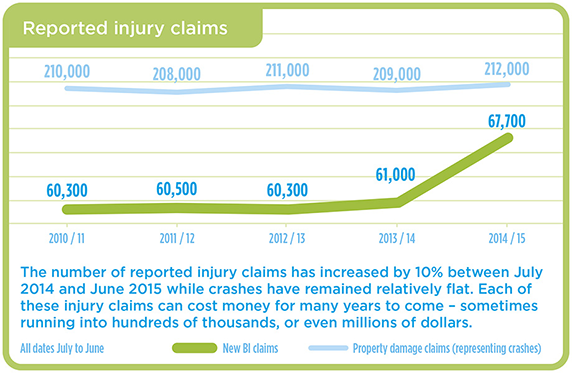 ICBC’s bodily injury claim costs, which cover pain and suffering, future care and loss of wages, are forecast to hit $2.3 billion this year, up 64 per cent since 2008. Higher legal and medical costs, more represented claims and more complex, catastrophic claims leading to bigger settlements are among the factors blamed for the jump. Injury claims are up 10 per cent from a year ago even though the number of crashes is unchanged. ICBC says more fraud is one potential explanation, as well as more minor soft tissue injury claims. If regulators approve the request, this will be the fourth straight year of basic insurance premium increases following hikes of 11.2 per cent in 2012 and 5.2 per cent in each of 2013 and 2014. ICBC has simultaneously reduced its optional insurance rates – on which it competes against private insurers – in five of the last seven years. ICBC spokesman Adam Grossman said the net effect is the average customer has seen their overall auto insurance costs rise by less than 10 per cent since 2008. Grossman said this year’s required increase would actually be “on the order of 12 per cent” were it not for the constraint of the rate smoothing policy. Transportation Minister Todd Stone said even the maximum 6.7 per cent this year is too much. “We believe that’s not acceptable and the rate can and should be lower than that,” he said Monday. Stone appointed ferries commissioner and former deputy minister Gord Macatee to help ICBC pare the hike. Asked if the province might reduce the annual $160-million annual dividend it extracts from ICBC each year, Stone said those transfers are from ICBC’s excess capital on its optional insurance business and do not affect basic rates. He acknowledged an optional rate cut would help ease the pain for the majority of motorists who also buy their optional coverage from ICBC, but made no commitment to enable that. The Bank of Canada’s recent interest rate cut has significantly reduced the projected returns of ICBC’s investment portfolio, Stone added.